Remember this design plan for my clients Aimee & Dave that I showed you last week? Well, the upholstered pieces arrived and look so awesome!!!! Now, in a perfect world, everything arrives undamaged and flawless... well, in real life, sometimes there are issues. Aimee & Dave's custom sofa arrived with some damage so I'm working on getting it fixed with the manufacturers delivery company. Have you ever heard the saying, "There's no such thing as a design emergency?" Well, I have and for the most part have to agree... no matter what, it's not a life & death situation and shouldn't be stressed over... BUT in this case, I have to admit that I totally felt sick to my stomach. Luckily, Aimee's really understanding and was so excited with the look of the pieces that she sent me some pics. 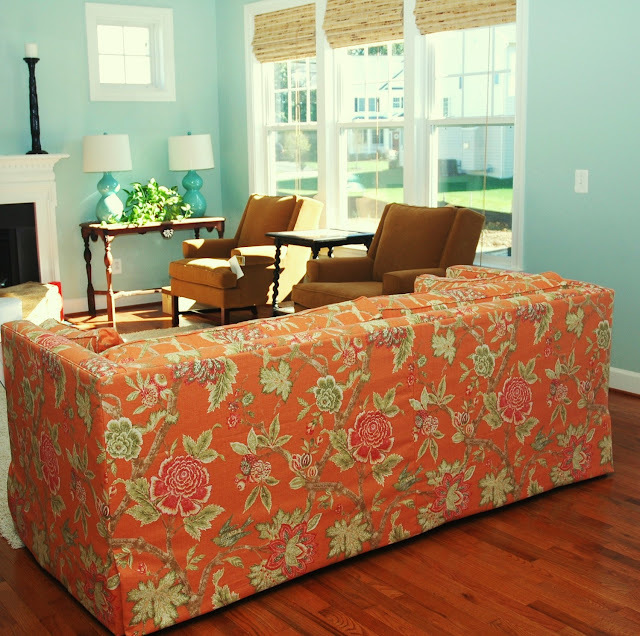 I just LOVE the orange Thibaut fabric!!! Oh my gosh. I can't wait to see all of the soft goods in place!! Have an awesome weekend!! Today is Dave's & my 5 year anniversary. We're celebrating tomorrow. We've become "grown-ups" together and I couldn't imagine any of this without him. .... maybe not quite grown-ups yet... but honestly, does anyone ever feel like one??? This is a PERFECT example of why a statement sofa should be done way more often than a neutral one! WOW, WOW, and WOW. That is gorgeous. The wall color, the blinds, the sofa, it's beautiful. i knew when i saw those design pages that it would be a gorgeous, original space. it's just beautiful already, lauren! I am LOVE with that room! So bright and happy. Perfect for a family. Thank you for sharing it with us. It looks beautiful! I love, love, love the orange and aqua!! Happy 5th Anniversary!! Enjoy your weekend! I just started reading your blog not that long ago. I am such a beige and white fan, but this looks STUNNING! What a great job you did! Every detail looks perfect! I bet they are just thrilled! And yes, fabric is FAB-TAS-TIC!! Amazing job! That sofa is incredible! I can't wait to see it with the finishing touches! Normally I don't like pattern on a large piece like a sofa but I LOVE this! You changed my mind, you are amazing! Happy Anniversary! Happy 5 years and trillions more!!!! hello, i'm over here because kayce told me to. and i always do as i'm told. first of all this room is gorgeous. love the orange. next, darryl carter! he is my favorite. i love his book and i am so jealous that you got to meet him. he's gorgeous on top of all that amazing talent. i think he edits better than anyone. so that's it. nice to meet you and now i will be following yet another fantastic blog. Oh my gosh - that sofa fabric is FANTASTIC!! So gorgeous! Happy anniversary - have a great weekend! Wow love that space!! Beautiful job, and that new photo of you Lauren! Absolutely stunning!! You are such a star! Oops Happy Anniversary -- I can't wait to see you both next weekend at High Point!! Don't grow up! Grown ups become boring old people who forget how to have fun! I always thought I would be grown up at thirty...forty...fifty nope didn't ever happen and I am really pleased to be still a teenager in my head!! WOW. This room is absolutely gorgeous. So personal, and so happy. I love it. I was a little afraid when I saw the fabric for the sofa, but had faith it would turn out right...this is above and beyond what I ever visualized. I need you to do my house!!! LOVE the orange sofa fabric too! I don't think I would have thought of using that much color in the living room but it works so well. And take it from me, I just turn 50 and no you never really grow up thankfully. love, love the sofa fabric and the room is gorgeous! The after room already looks like a magazine layout. How fun to think that can be a normal person's home - with a little professional guidance. Happy Wedding Anniversary! Our 5 year anniversary was yesterday too!! We were brides together :) We had a beautiful day together yesterday - hope you two enjoyed some time together too. Who would have ever thought an Orange couch...but it's really beautiful! Love the whole color scheme...the room is absolutely beautiful! That room took my breath away. I am just not brave enough to do a statement sofa like that. As beautiful as it is, I'm afraid of getting bored after a few years. Wow - that room is stunning. The colours go so beautifully together. Love the room! I remember having a conversation about feeling old with my grandmother who was in her mid eighties. She still felt young. Love! The sofa is perfect, and the color on the walls is just gorgeous!!! It's so fresh. Another great "Pure Style" room. Happy Anniversary! Can't wait to celebrate with you both next weekend. A very beautiful space! And most importantly Happy Anniversary!!! My sweetie and I will be celebrating 2 years on Tuesday. Cheers to you, Dave and your beautiful family!! I am new to your blog. Could you help me. I have been looking for lamps for a long time. I like the ones you used in the April 15 post of Susannah and Keith's home. If you could contract me at my blog site http://lifeonthefarmandotherwarstories.blogspot.com I would appreciate it. OoooooOOO. Love it! So nice to see such vibrant alive color! Happy Anniversary! May you enjoy 70 more! Lauren, I LOVE that room! I've also really enjoyed seeing your process on how you present your ideas to a client. I'm hoping to start a business one day as well and need all the advice I can get. Have a great anniversary Lauren...I love blue and orange together - my bedroom has a blue bedspread and I bought funky orange lamps at HomeGoods to go with, but decided I wanted them in the living room - there is a pic of them on my blog. I have a blue Chinese art deco rug and thought the orange would spice up the living area. Your clients' room looks lovely! Killer sofa, Lauren. I adore the boxy silhouette and the color and pattern are amazing. Happiest of happy anniversaries to you both! That sofa is to die for!! I love a bold print as a statement piece and the fabric you selected is perfection! Ok the similarities in our lives are freaking me out completely. I have commented that I have 3 girls the same ages as your 3 boys before, but Eric and I celebrated our 6 year anniversary yesterday (the 9th) + we met in college also. There is a year between us also + like Dave he was the "guy from New York" + it was love at first sight for me! Happy Anniversary to you both! Love the sofa! Looks amazing...Thanks for sharing. Happy Anniversary! I was hoping you could tell us what program you used to present the options for the room (fabric, furniture etc.) I would be thrilled to know and thanks again! Everything looks lovely! Great job, Lauren, and Happy Anniversary! Just celebrated my 16th wedding Anniversary on the 8th! I remember the 5th well! We had just found out that we were pregnant with out first son (to be followed by 2 more!) I am a decorator in CT and hoping to get a blog up and running in the next 6 months! I love your designs! Keep up the good work...balance of family and work..it gets harder as the kids get bigger! Wow! What a beautiful room already. It has such a vintage-meets-modern feel to it. Can't wait to see the finished result! This is Aimee, Lauren's super-happy client. I can't help but share that the entire process of working with Lauren has been phenomenal. We are so pleased with the design she developed for our family. It really suits us perfectly. What a joy it is to walk into a room and feel happy at the sight of it. Thanks for all your work, Lauren! LOVE!!!!! Lauren, that room is already amazing!! I'm drawn to the aqua/orange scheme myself. I painted my living /dining room in a shade of aqua, but then lost my nerve and painted over it with a mushroomy kind of grey. I regret that decision! The aqua is so fresh and clean looking, I'm going to have to try it a second time. The room looks wonderful so far - I'd feel totally at home sitting there, enjoying a cup of Earl Grey tea. omg that orange sofa needs to find a new home in my family room!!! I am in LOVEEEE!! PS- that picture of Dave is priceless- what s fantastic father! Oh, I love it. What is the paint color on the wall? I have those lamps and love them, and they are that exact color. Love love love this. What is the fabric for the drapes going to be? this might be one of my fav projects ever!! I love this room! I think this just might be my favorite design of yours. Can't wait to see the finished project. I agree with everyone about using a statement sofa. It makes a point without a doubt. Happy Anniversary! My husband and I just celebrated 10 years on Oct. 7.
gorgeous gorgeous gorgeous! sorry about the damage, but so glad you have an understanding client! who is the manufacturer of the sofa? the lines of it are perfect! I admire how you turned your living room to a relaxing and appealing place. I'm also planning to renovate our living room and to change the flooring as well. I'm thinking of having hardwood or tile. Clearwater can easily clean tiles, while wax and a lot of polishing is the key to maintain hardwood. If I'm into maintenance, then I would prefer tiles, but my husband wants the look of hardwood. Oh well, I hope we can decide soon. I love the post about the osage orange!!! I never knew what they were called, but as a child we would feed these to my grandfather's horses when we'd visit in Mississippi!!! We simply called them 'horse apples'!!! But I do recall my grandfather, strictly, forbidding us to taste them. They make beautiful decor!